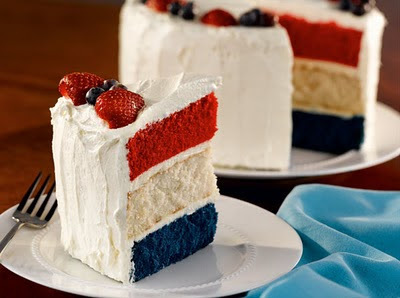 I forgot to take pictures but Britton and I made this cake for the 4th of July. We had fun spending the day with friends, then off to the park to watch fireworks off the butte and then back to our friend's backyard to watch National Treasure outside with a projector on the back side of the house. That looks amazing! I love themed food for holidays. :o) My sister always makes a jello trifle with red, white and blue stripes. Thanks for sharing the recipe!